My name is Eldrid Røyset Førde, and I live on the west coast of Norway. 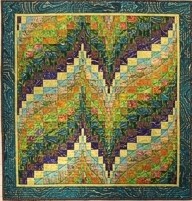 I have been making patchwork and quilts since the late eighties, – more than 20 years now. 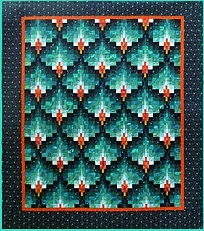 Since 2002 I have been showing my quilts on my webpage at http://kameleonquilt.com I have also published a few patterns, both on paper and as direct download. Lately I have also dabbled in fabric design, and have a few small fabric panels for sale. 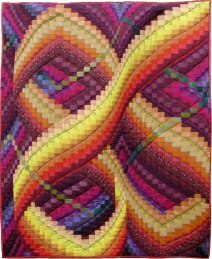 When I first went online with my website kameleonquilt.com I included a section where I wanted to post about inspirational sources for my work, and also about some of the processes as projects evolved from start to finish. The intentions were good, but I have not managed to post as much as I wanted. In the hope that the blog instruments available today will make the process of “posting on the go” a little easier and less time consuming, I want to give this a new try by starting this blog. In my experience, it is often the many small, everyday things in my immediate surroundings that provide inspiration and make the ideas coming. I do not know yet, – but I guess, – that this will reflect on my postings here too. I hope you too will find some of it interesting and useful, though. More info about me can also be found on my website. Eldrid, thank you for stopping by and adding your insights to my post on Rowan Trees. I too am a quilter (living on Canada’s east coast near the small fishing village of Eastern Passage) and so was delighted to discover your kameleon quilts. My quilting friends will be amazed when I show them what wonders you’ve created. In the past year I’ve mostly quilted tea cozies as well as a prayer quilt (a tied quilt that allows numerous participants to pray for the quilt recipient while tying one of the knots). I hope all goes well with your surgery. Looking forward to reading your future posts. I do like rowan trees and have several in and around my garden. The flowers have a lovely smell, and around here we are saying they are twice decorative, – the actual blossoms, and the colourful berries and leaves in the autumn. I have heard the term prayer quilt before, but did not know exactly how it was done. What a wonderful way to quilt a quilt (or tie, as in this case). I have discovered with great joy your new blog. This is great way to keep in touch with you and with your wonderful quilts. Thank you for posting a link to our blog, I have posted yours too. I was equally surprised to discover the blog of your group, and with your name among them – thanks to the link you had already put up. Your blog is a feast to the eyes, – I am really impressed by everything you have made. I particularly liked the eggs, and the collection of Eiffel towers. I will go back and look further as I did not get to see everything at once. My daughter has been reading your blog for quite some time and today she sent me a link to it. When I talked to her on the phone she ask me what I was doing, I told her looking at the blog you sent me a link to. I said what lovely quilts and pictures. She said mom, she is like a Norweigen version of you! As I love to quilt and I love taking pictures. I would love for you to check it out and see some of my pictures. I will enjoy checking and reading more of your blog. Takk for besøket på bloggen min. Steinbitten er deilig mat men mannen min får dem ikke ofte. 3 stykk i 6 år. Han fisket med stang og pilk denne gang. Han vil gjerne vite hvordan mannen din får den. Du skiver at han får mange av den. Vi bor ikke langt fra hverandre så det skal være mulig at min man oftere får en steinbit når han vet hvordan. Jeg har lest din blog og så mange hjort i hagen din. Du bor der veldig flott. Jeg liker din quilts også meget. Blå natt er fint! Eg skulle ønske eg kunne sjå dei nydelege arbeida dine “live” sidan eg gjekk glipp av utstillinga i Gamlebanken, men å følge med på bloggen din er også god kompensasjon. Mannen min er styrmann på ein autolinebåt, og dei fiskar langt til havs, – mest nordafor, – så eg trur dessverre ikkje han veit om så mange gode steinbitplassar heromkring. Men gode er dei iallfall, – når ein berre får tak i dei. Det var ein sjeldan stor gråsteinbit. 🙂 Vi får dei vanlegvis ikkje større enn 6 kilo. Flekksteinbit får vi opptil nesten 20 kilo. Det er og ein veldig god matfisk. Blåsteinbit, som vi får opptil 30 kilosfiskar på lina av, er ikkje særleg god å ete. Geleaktig, vassfylt fiskekjøtt utan særleg smak. Thanks so much for your comment today! I’ve tried to find a reply email but couldn’t. Blogger and WordPress won’t play together nicely for some reason so all WP bloggers have been set by default to “no-reply”. So I thought I was replying but I guess not. I have followed your blog for awhile now and I love it. You do such beautiful work! I think that if you ticked the Notify me-box, you will receive an email with this reply. 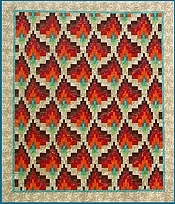 In my post here: https://kameleonquilt.wordpress.com/2017/06/01/information-on-this-years-quilt-festival-in-suzdal/ there is a link to a pdf file with information on this year’s tour, with contact information for booking. I guess you may use the same contact address for inquiries about next year. We booked the flight to Moscow ourselves, but from there everything else was organized by them: we were picked up at the airport and driven to our hotel, guided around town, escorted on the train and bus to Suzdal and back, and we had a great time throughout.